“The Influence mix” – Information access in the new age and empowerment of consumers ¿Decline or reformulation in branding development? The new technological age is changing the rules in marketing. Now consumers are influenced by other sources of information and brands might be losing the battle. Itamar Simonson and Emanuel Rosen state in their book “Absolute Value” that consumers now base their decisions on reviews from other users, opinions and other emerging technologies that are turning choices more rational. Therefore traditional sources of information controlled by marketing are fading. 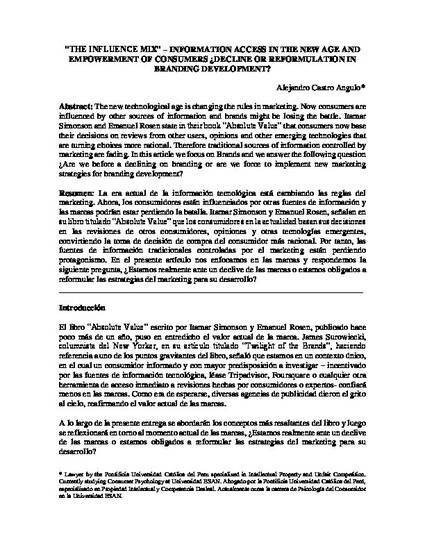 In this article we focus on Brands and we answer the following question ¿Are we before a declining on branding or are we force to implement new marketing strategies for branding development?